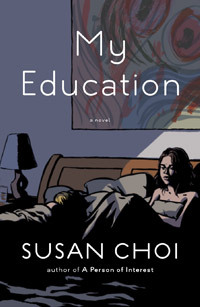 I picked up Susan Choi’s book My Education at the library because I was in the mood for an academic novel, and Choi is an author I’ve been meaning to read for a while. I suppose it was my desire for an academic novel that made me enjoy the first half better than the second, because in the second half, the novel takes off in a different direction. So it’s probably not fair to call this an academic novel at all, because its interests ultimately seem to lie elsewhere. The first half was very enjoyable; it tells the story of a young woman heading to graduate school in English at an unnamed school that has to be Cornell. She is well-trained in contemporary literature and the latest in literary theory, but gets a chance to be a TA for a professor teaching Chaucer where she can learn something very different from her usual fare. It’s not all about the literature, though; this is a professor who has a reputation for sexual exploits and whom she finds attractive. As the book goes on, it turns into a novel about love and sexual obsession, although it doesn’t follow the track that you might expect, given the set-up. Its real interest lies in exploring various kinds of desire and obsession and the love that is possible and not possible between people of different ages and backgrounds. The writing is interesting and rich, with lots to think about, but I don’t think the story really holds together. The second half slowed down too much and my attention wandered. Choi does have a lot to say about love — how it changes us and how our ability to love changes as we get older. I just think it would have been a better book if it were shorter and more tightly focused. At least you really liked the first half. Do you think you will try something else by her? I don’t think I will unless I get a strong recommendation from someone I trust. I wouldn’t be against reading her again, but I would need a good reason, I think. Choi isn’t writer I’ve come across. I’m not certain see’s published in the UK, although i will check that out. Like you, I’m a sucker for a novel set in academia. Did you ever read Rosy Thornton’s ‘Hearts and Minds’? There were passages in that which were so true to life they made me wince and a colleague of mine sit down and completely reassess where she was going in terms of her career. I did read the Thornton book, Alex, and I liked it quite a lot. I’m in the mood for more, and will have to try to track down other good ones. Thanks for intro. me to Susan Choi. I think I’d like to read some of her books… but, maybe not this one. Which is the best you’ve read of her works? This is actually the first Choi I’ve read, so I can’t really say which is her best. Perhaps the one called American Woman? That sounds interesting at least. I wish I could help more!